A 6-cm curvilinear incision is made from 2 finger breadths proximal to the radial styloid process, to 1 cm distal to the base of the meta-carpal (Fig. 2A). The radial artery is exposed and retracted, as are branches of the radial sensory nerve. The first extensor compartment retinacu-lum is released, as would be performed for De-Quervain's disease, leaving the volar attachment intact. At the myotendinous junction of the APL, the ulnarmost slip of APL is released, and freed to the level of its insertion at the metacarpal base (Fig. 2B). The EPL and APL tendons are exposed—in between is the capsule of the TM joint. Capsu-lotomy is performed and the trapezium is resected after cutting it partially into four fragments with a saw, and infracting it with an osteotome (Fig. 2C). The base of the thumb metacarpal is not squared off—not resecting a small sliver from the metacarpal base may help to preserve the intermetacarpal ligament. The FCR tendon is visualized in the base of the arthroplasty space. With traction on the index and long fingers, the scapho-trapezoidal joint is inspected, and if arthritic, a resection of the proximal trapezoid is performed . The APL slip is poked through the capsule to within the arthroplasty space, and using a right-angle clamp, passed through a slit in the FCR tendon (Fig. 2D,E). The thumb is positioned so that it rests on the index finger in the fisted position—distracted so that the metacarpal base is at the level of the index carpometacarpal (CMC) joint. A Kirschner wire is not placed. The APL slip is pulled taut, and a 3-0 vicryl suture is placed between APL slip at the level of the metacarpal base, and the extensor pollicis brevis (EPB) tendon (radially) and the tissue deep to the extensor pollicis longus (EPL) tendon (ulnarly). Fig. 1. (A) Preoperative PA stress radiograph of the right thumb, and (B) lateral radiograph. Fig. 2. APL suspensionplasty technique (A) Skin incision. (B) Distally based slip of APL. (C) Trapezium excision (black arrow identifies the trapezium). (D) Passed through/around FCR. (E) Magnified view (black arrow identifies the FCR tendon). The capsule is closed and a thumb spica splint is placed for 10 days. At that visit a thumb spica cast is placed for 3 weeks. 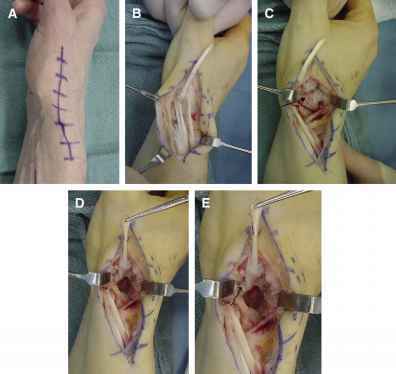 At approximately 4 weeks after surgery, a forearm-based thumb-spica splint is made and range-of-motion exercises begin. 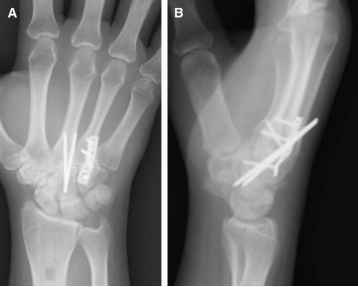 Opposition across the palm is avoided until 2 months after surgery, but thenar isometrics begin as soon as comfort allows. Pinch and grip strengthening generally begins around 6 to 8 weeks after surgery, and most patients are weaned from their splint by 10 weeks.